Storyline: It was a hot summer day and the farmer was out, working on his land. He was an tall, old farmer, black boots, pants with suspenders, a large brim black hat and a long white beard. On the horizon, the circus train was just happening to pass by when something fell out.The farmer stopped his work and went to see what it was. When he came closer, a little creature turned to him, smiling. It was a clown baby, all dressed in red, with a yellow lacing around his neck. The baby was happy to see the man and quickly did some somersaults. The farmer took the baby home where they had dinner and washed their faces, little one washing off his clown makeup. The farmer then put the child to sleep in his own bed and waited on a chair until the morning came. They had breakfast and then they did all the work that needed to be done on a farm: milk the cow, get the eggs, work the field. About lunch time, they went to a picnic under a big tree. They waited there, looking at the horizon, for the circus train to came back. They went to the tracks and herd the train approaching: toot, toot, toot. Then it stopped, and the baby clown was reunited with his big family. The farmer and the clown hugged and kissed and waved good bye to each other. Shortly, the train was gone and the farmer went back home, followed by a monkey. 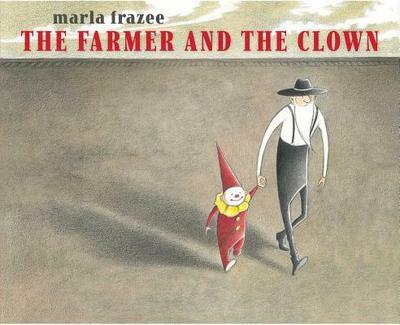 Illustration: Marla Frazee is also the illustrator of this book. She is doing an amazing job being that the whole book is almost wordless, the only word is in fact an onomatopoeia – toot, toot, toot, goes the train. The storyline describes above was inspired by the thirty pages fully illustrated of this wonderful book.